These units will lower the front of your Caddy 25-120mm, they will give you maximum flexabilty when setting up the perfect ride height for your truck and are ideal to match with your "axle flip" or "drop plates". Produced to the highest quality standards with a sporty well balanced spring-damping characteristics. 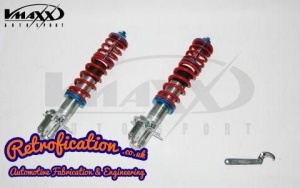 For the money these are quality units that provide as smooth ride, unlike the cheaper coilovers out there.